A very popular freshwater lure . 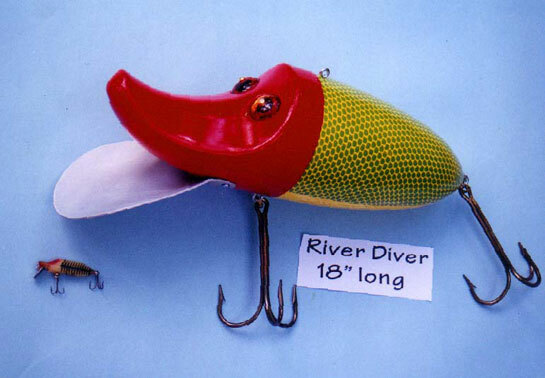 Lures of this style were made by many companies from the '30's or earlier to the present day. A good one for the bass fisherman .I think it is also used up north for pike and muskie. Paint:A very fine green and yellow scale pattern with a red head and yellow belly. Features an aluminum diving lip. Body is 18" long x 6" diameter . 6" long treble hooks.